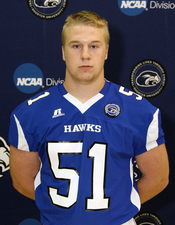 Rabun County High School alumnus Jeremiah Brown, who plays linebacker at Shorter University. Photo courtesy of Shorter University. Recognize this face? Jeremiah Scott Brown is a junior linebacker at Shorter University in Rome, Ga. We caught up with the Trion/Lakemont native to chat about his favorite memories and future aspirations in a local spotlight Q&A. Georgia Mountain Laurel Magazine: How did you get started in football? What made you like it? When did you realize you fell in love with the sport? When did you realize you had the abilities to play at the next level? Jeremiah Brown: I started watching football at a young age and grew a liking for it, I wanted to play but the earliest you could play was 9 and 10 year old ball. One day when I was eight years old my dad received a call from one of the Rec. league coaches asking if I would play on his team and I said yes. On the first day of practice I discovered that I had a love for hitting, and learning more about the game each day my love grew stronger. I fell in love with it on the first day of practice. I was always good as a young kid but so are a lot of other people, so I would say I noticed I could play college ball once I got in high school. GML: Tell us about your favorite accomplishments in your career thus far. Brown: Being named Defensive Captain my senior year of high school; Leading the team in tackles; Receiving defensive player of the year award; Being awarded 1st team all-region as a Linebacker; Receiving a scholarship to play college football; Being able to competitively compete at the college level. GML: Talk about growing up in Lakemont. What do you miss most about home? Brown: I actually grew up in Trion, Ga. Lakemont is where I currently reside. Trion is where I was raised from the age of two to high school. My sophomore year of high school I moved to Lakemont where I then attended Rabun County High School. I miss family and friends of course. But mostly, and I believe you could ask any college football player and they would say the same, there is nothing like playing under the lights on Friday nights in high school. By saying that I mean no disrespect towards college football because it is as great of an experience as any, I mean I’ve played in the AT&T stadium in Texas (where the NFL’s Cowboys play) that’s amazing, but there’s just something about Friday night high school games. GML: Talk about the recruiting process and why you ended up at Shorter. Brown: I started receiving emails and calls from college coaches my junior year. I talked to and visited a few schools ranging from smaller NAIA schools to D-1 AA schools. One day I received a text from a Shorter coach asking if I would be interested and when I could go and visit, I set up a date and went on that visit. While I was there I think after talking to the coaches is when I decided. I guess it was how much the coaches made me feel wanted that really brought me here. GML: What is your major/career focus? Why? Brown: My major is nursing. I choose this field because it has such a wide variety of fields inside the field. It is a job that is in high demand and you are able to help may people and will never be without a job in this career. GML: Favorite memory competing for Rabun County High School (on or off the field). Brown: I would have to say my favorite memory is beating Commerce my senior year after we had let the win slip out of our hands my junior year and we didn’t just beat them my senior year we completely shut them out winning 28-0. GML: Favorite memory competing for Shorter (on or off the field)? Brown: My favorite memory would have to be when we played in Arlington, Texas at the AT&T Stadium (where the NFL’s Cowboys play) in front of thousands where I made the first tackle of the game as well as more after that but they weren’t like the first one I made where I was put up on the giant jumbotron. GML: What will you miss most about football after college is over? Brown: Simply being with the team and playing the game. Don’t get me wrong you can make great friends in life but there is nothing, and I mean nothing, like working harder than you ever have with your teammates. And with all that hard work, blood, sweat, and tears you have with your teammates you build a bond stronger than any other and that bond is a brotherhood. GML: Go back in time and talk to your freshman self. What advice would you give to him? Brown: I would tell my high school freshman self to work hard, harder, and even harder... you’ll be really good soon if you stay the way you are but get in the weight room and get on the field when no one else is and put in the work so your time will come sooner and when it does you’ll not only be good but have a chance at being great. GML: Anything else you'd like to add here and anyone you'd like to thank. Brown: I’d like to thank my family especially my mother and father for pushing me to be the best I could be and always there to support me, because without them I don’t know where I would be today. I’d like to thank my high school coaching staff for making me a better football player. My high school Head coach, Coach Lee Shaw, for bringing me into his office and telling me I had the ability to play college football and always pushing me to work hard. As well as my position coach, Coach Rob Stockton, critiquing me everyday at practice and making sure I was at my best, along with working me hard to develop my skills to make me better. Know of an athlete who deserves the spotlight? Let us know by contacting us today!